This recipe is a variation of my roasted winter squash marinara recipe. I skip the roasting part since we don’t have an oven here. Even without roasting, this hearty squash marinara packs a punch with the addition of ground cumin, coriander, and a squeeze of fresh lemon juice at the end. I use shredded winter squash in this recipe because we’re able to buy it pre-shredded at the market. It comes in kilo bags which gives us enough squash for two batches. I cook half of it and freeze the other half for later. 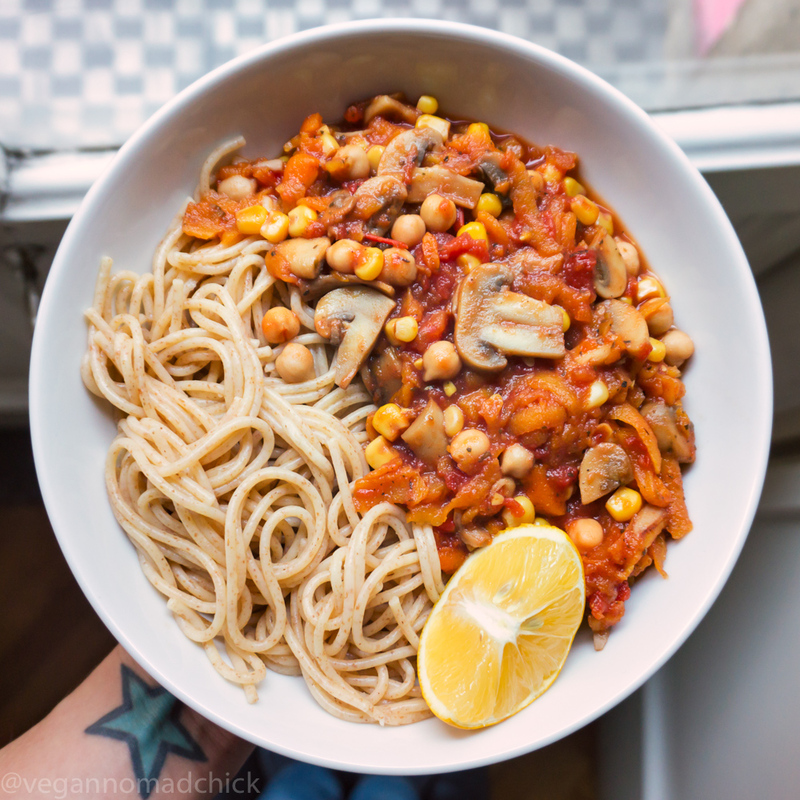 I like this sauce with chickpeas, corn, and plenty of sliced mushrooms. Feel free to make it your own by adding your favourite veggies, herbs, and spices. Serve this hearty sauce with pasta, rice, or potatoes along with a wedge of lemon. Stir in the winter squash, chickpeas, corn, diced tomatoes, and passata. Bring to a boil and simmer for 10-15 minutes stirring occasionally (so the liquid reduces and the sauce thickens). Lower the heat slightly if the sauce starts to stick to the bottom and stir more often. Serve with your favourite starch or enjoy it on its own. This recipe makes enough for four big servings. Lemon juice can get funky if you cook it, so if you don't plan on eating all of this in one sitting, skip the lemon juice and serve the sauce with a slice of lemon instead. 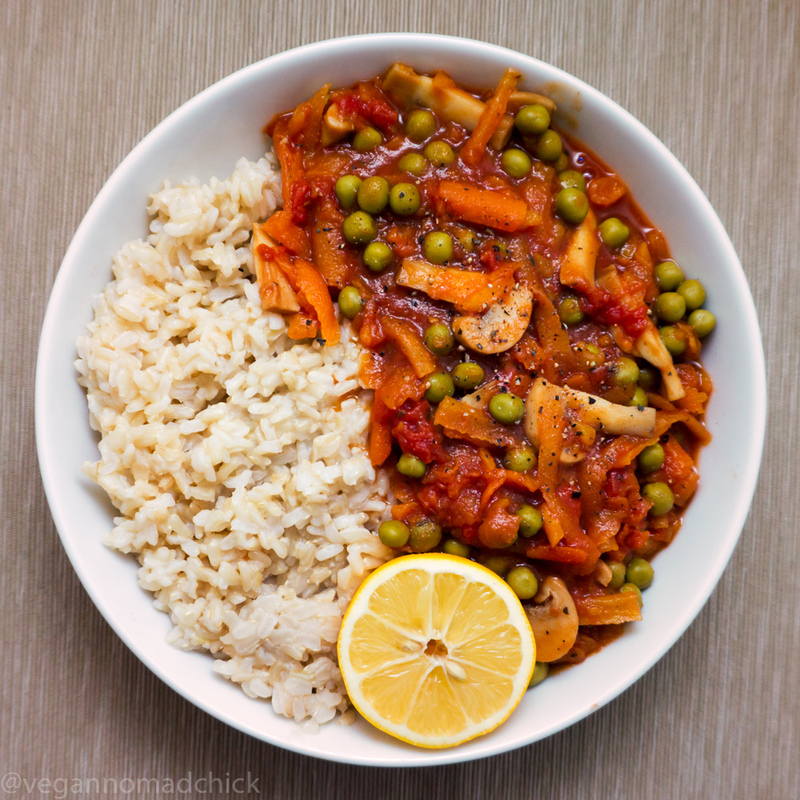 Then you can reheat your leftover sauce later without worrying about a weird cooked lemon taste. I like using diced tomatoes for the tomato chunks and passata or tomato paste for a deeper tomato flavour. If you don't have these on hand, try using some of your favourite pre-made pasta sauce.